In the summer of 2010 the Royal Borough of Kensington and Chelsea ‘Core Strategy ‘ was approved by a government-appointed examiner after a series of hearings held at the Town Hall in Hornton Street. The ‘Core Strategy’, more recently renamed the ‘Local Plan’, set out the Council’s planning and development strategy for the forseeable future, together with the policy statements that embody that strategy. Chapter 23 of the Core Strategy dealt with the site allocation for the Kensington Academy and Leisure Centre development (Policy CA 4). The site was comprised of two land parcels, the first of which already hosted the Kensington Leisure Centre. This area was earmarked in the Core Strategy for a rebuilt or redeveloped leisure centre on the same footprint, more or less, as the existing structure. The second adjoining land parcel was earmarked for a new secondary school, now the Kensington Aldridge Academy. The Kensington Academy and Leisure Centre (KALC) project was destined to become one of the biggest and most ambitious development projects sponsored by Kensington and Chelsea Council in recent times. An application for planning permission was submitted in May 2012 and was duly approved. Demolition and excavation to prepare the site for development began as soon as planning permission was granted. The Grenfell Action Group was formed in 2010 to oppose the KALC project and defend the rights of the residents of Lancaster West Estate, a sprawling inner-city housing estate of nearly a thousand dwellings, mostly working class, multi-cultural and multi-ethnic. The people of Lancaster West stood to lose a great deal to this massive over-development at the heart of their estate, not least the well-loved and well-used open-space of Lancaster Green, the defence and protection of which was one of our primary aims. In order to decide whether or not the site in question was suitable to host the new academy, and to judge whether or not the Council acted properly in designating it for this purpose, it was necessary first to establish the nature and composition of the site. “sports and leisure centre (Class D1: Non-residential Institution), including dance, gym & sports halls, large & small swimming pools, café, football pitches, car parking and incidental open space.” (23.4.5). Whilst this was a reasonably accurate description of the eastern land parcel, which contained the leisure centre, it largely ignored, and grossly misrepresented, the western land parcel earmarked for the academy. The reference to “incidental open space” was particularly misleading, as approximately 80% of the western land parcel was public open space, mostly green space, which was used constantly by the local community as a right-of-way, for carparking and for informal recreational purposes. The earliest reference to hosting a school at this location had appeared in the “Towards Preferred Options…” document, a precursor to the Core Strategy, in the summer of 2008, when it was first suggested that the Sports Centre and a new school might share what was known as the “Kensington Sports Centre Key Site”. Even at this time the suggested school site was considered only as an under-utilised appendage to the Sports Centre, and there was no recognition of the substantial open space/green space at this location which had been used for many years as a vital open access community resource. (ii) Lancaster Green. Approximately 40% of the proposed academy site was composed of open green space which included footpaths, grassed areas, flowering shrubs, and a significant number of mature trees. Lancaster Green, as it was called, had been designated, for a number of years, as one of the Council’s local parks. It was listed as a park on the Council’s website and was marked as a park by an official Council signnpost. It was listed in the Council’s ‘Open Space Audit’ (2004), as the ‘Grenfell Tower Amenity Space’ (4350 sq metres), and was listed in the ‘Parks Strategy’ (2010) as the ‘Lancaster West Secondary Park’. Although managed by the Council’s Parks Department the legal status of Lancaster Green was actually more complicated than this would suggest. 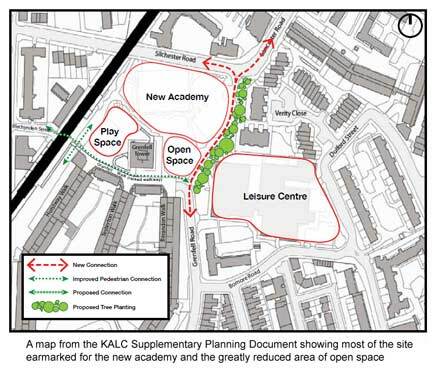 A Title Review of the proposed KALC site, carried out by the Council’s Legal Services Department in June 2010, revealed that both Lancaster Green and the Grenfell Tower Playground area were covered by the same title deed as the adjoining part of Lancaster West Estate, and therefore properly belonged to Lancaster West Estate, rather than the Sports Centre. This was a clear indication that both Lancaster Green and the playground area were originally created as essential amenity space for Lancaster West residents. These amenity spaces were particularly important to Grenfell Tower residents, who had no balconies or private amenity space, and whose internal public areas received no natural light. It is noteworthy also that RBKC is generally deficient in playspace,as is Lancaster West Estate and the open space in the western part of the proposed KALC site, including the sports pitches, had historically served a vital role in helping to mitigate that deficiency locally. (iii) The sports pitches. This hard-surface 5-a-side football (or tennis) facility was ostensibly maintained and controlled by the Sports Centre. However Sports Centre managers had long since abandoned any attempt to secure it for the exclusive use of their patrons, and it had long been freely and informally used (ie as of right and free of charge), by local people (including local children) as a sports and play space, albeit shared with paying Sports Centre patrons, who generally enjoyed preferential use of the facility. In fact no such clarification was ever added, and the contempt with which such criticisms were treated is evidence of a prejudiced and self serving attitude to the site on the part of Councillors and Council Officers throughout this entire period. This attitude is evident also in the following chronology. 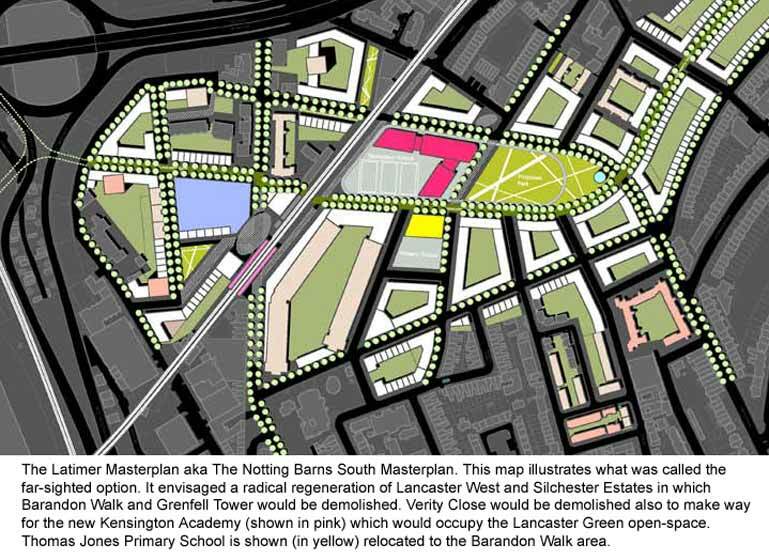 The idea of building a school on the “Kensington Sports Centre Key Site” was tentatively suggested in consultation for the “Towards Preferred Options Core Strategy and the North Kensington Plan” document between 29th July 2008 and 10th October 2008. It was suggested that the Sports Centre and ‘a new school’ might share the site. There was no mention in this document of the open space on the site, or of its’ importance as an open access community resource. The site was presented only as an underutilised appendage to the Sports Centre. This recommendation was subsequently featured in a report, “Development of a New School in the North of the Borough” submitted by the Working Group to the OSC dated 11th March 2009. The new park proposed in the Masterplan was intended for the site currently occupied by Verity Close, a residential area and part of Lancaster West Estate. The intention of the Masterplan was to demolish Verity Close to create the space for a substantial new park. This idea appears to have been subsequently shelved. The recommendation to site the new academy at Lancaster West was, of course, followed through in the Core Strategy, but there would be no new park. Most of the existing open space would be lost to the massive bulk of a new 1200 pupil academy, and a much reduced Lancaster Green would be left in it’s shadow. This represented a net loss to the local community of at least half the existing open space, and there would be enormous pressure on the remaining green space to serve the patrons of the new leisure centre, as well as the 1200 students attending the academy, which would be built without a playground of adequate size, and entirely without external sports facilities. The fact that Lancaster Green was needed as essential residential amenity space for the residents of the adjacent Grenfell Tower hardly figured in the Council’s plans at all. “Location of a New Secondary School In North Kensington” authored by James Masini supposedly considered and compared six possible sites in North Kensington to host a new academy – Barlby Road Primary School, St Mary’s/Middle Row Primary Schools, the Princess Louise Hospital site, the Kensal Gasworks site and the Latimer site. Having perfunctorily excluded the other five sites Masini recommended the Latimer site (ie Lancaster Green) as the site for the Academy. According to a Council newsletter published in July 2011, all of these sites, together with the Silchester Garages site and the Virgin Active site (a former school) in Lancaster Road were “carefully examined but ruled out” by the KALC planners. However there is no evidence of any modelling or feasibilty studies apart from the one conducted at Lancaster Green, at any of the other sites which were allegedly considered, either before or after Massini’s study. Another inconsistency of the Masini study is that the Working Group on Secondary Provision in North Kensington had already identified the Lancaster West site for the academy in a report to the OSC on Family and Children’s Services in November 2008, several months before Masini supposedly performed his exploratory study. It is noteworthy, that in McAslan, just as in the Core Strategy, the site is described without reference to the substantial green space (ie public park) at the heart of the site. To the casual reader, Lancaster Green, which is left unnamed, might well have been mistaken for derelict wasteland, and one suspects that this may well have been the intention of the chosen wording. Again Lancaster Green was not named, and there was no reference to a park or public open space on the site. It should be noted that all of the above chronology took place before the concluson of the Strategic Sites consultation, and therefore pre-empted the approval of the KALC site allocation in that consultation. “….none of the Options actually provide the required site area needed for an urban area, some provide a lot less and this needs to be understood when reading this report. However, the Feasibility Study itself made no allowances for preservation or re-provision of the amenity space, and neither did the subsequent Supplementary Planning Document. It shows a complete disregard for the open space on the western part of the site proposed for the academy. This is apparent from the various names given to the site in all the various Council documents, and from the accompanying descriptions, all of which invariably ignore, and therefore misrepresent, the substantial open space (approximately I hectare) which was arguably the key feature of the academy site. This suggests a significantly biased and prejudiced attitude on the Council’s part. For two whole years prior to the approval of the Core Strategy the Council planned and conducted feasibility and modeling studies of the site aimed at the eventual delivery of the KALC project, yet at no time was the name ‘Lancaster Green’ mentioned in the documents. On a number of occasions the consultation process was pre-empted in the rush to progress plans for the project, and there is no evidence throughout the two years of the slightest regard shown to the Secretary of States Guidance in relation to planning for open spaces (PPG 17). This clearly demonstrates a significant bias or prejudice in favour of the Council’s intention to develop the site, come what may, and against the interests of the local population, to whom the open space on this site had real and irreplaceable value. The misrepresentation of the academy site must surely have distorted the Core Strategy consultation. Only consultees with an intimate knowledge of the site, would have realised that the description of the site was inaccurate, and as very few local residents had been invited to participate there were consequently very few comments or criticisms addressing the loss of open space that the proposed development would inevitably entail. The chronology shows a general tendency to pre-empt the consultation process by assuming constantly that the academy would inevitably be located at the proposed site, regardless of whatever objections might be raised in consultation. A particularly blatant example of pre-emption was the submission of the “BSF Strategy for Change, Part 2” application for government funding in May 2009. This named the Lancaster West open space as the site of the proposed academy in order to secure BSF funding, but was submitted to the DfE before the Strategic Sites consultation had been completed in June 2009. Throughout the time that the Core Strategy consultation was ongoing the Council was also conducting another consultation exercise in the Latimer area. This was a ‘Stock Options Review’ which had been prompted by anticipated cuts to the government subsidy payable into the Housing Revenue Account, which funds all social housing provision. The Council was exploring ways to increase revenues from its housing estates to meet the shortfall, and one of the options being considered was large-scale regeneration of the Latimer Area, also known as Notting Barns South. Unlike the Core Strategy consultation, which was conducted on a highly selective and exclusive basis, the Stock Options Review was widely publicised on council housing estates in the Latimer area and most households were routinely and repeatedly contacted by mail. The ‘Stock Options Review’ diverted attention away from the Core Strategy consultation. In fact most local people were unaware that the ‘Core Strategy’ consultation was even in progress, had never heard of the ‘Core Strategy’, did not understand what it was, and had no reason to suspect that it might be as important, or even more important, than the Stock Options Review. The Council meanwhile made no attempt to explain any of this to residents, or to engage them in the ‘Core Strategy’ consultation. Furthermore, the ‘Stock Options’ documentation that local residents were receiving withheld information about the site allocation for the Academy, and gave false assurances that any new development in the area would be confined to the ‘Silchester Garages’ site. In fact the development plans for the Silchester garages were quietly expanded into a full redevelopment of the entire Silchester Estate. It should be noted that the ‘Core Strategy’ consultation was nearing completion at this time and the proposed site allocation for the academy was well known to Council officers involved in the ‘Stock Options Review’. It is noteworthy that this letter specifies only a North Kensington location for the proposed school. Lancaster West was not mentioned. The co-incidence of the Core Strategy and the Stock Options Review, both in time and in relevance to the Lancaster West community, highlighted the question of why it was deemed appropriate to consult the entire community on the Stock Options Review, but only consult select stakeholder groups on the Core Strategy. It also raises questions as to why the Stock Options review was used to mislead this community during 2009 about the proposed site allocation for the Academy. This study proposed a radical regeneration of the entire area involving demolition of virtually all the council owned housing in the entire area. However this report was withheld from the ‘Stock Options’ consultees, and they were shown only an edited extract from which all the ‘scorched earth’ detail of the radical regeneration scenario had been removed. This appears to have been a cynical attempt to manipulate the ‘Stock Options’ consultation by witholding information about the more controversial and more destructive aspects of the regeneration that was being considered. The site allocation for the Academy, which ultimately appeared in the ‘Core Strategy’, was a key element of the Masterplan. The Council was eventually forced, following repeated refusals to do so, to publish the full Masterplan in June 2010 under ‘Freedom of Information’ legislation. Redevelopment plans for the Silchester Estate have since been resurrected, and the KALC project was never in doubt. Both of these projects were key elements of the Masterplan. Following the eventual recovery of the housing market we fully expect them to now revert to type and come after the rest of Lancaster West. KALC may well be just the start of a much bigger fight. Because only a select few local ‘stakeholder’ groups were invited to participate, the Lancaster West community was effectively excluded from the decisive stages of the Core Strategy consultation, and most particularly from the consultation on the Strategic Sites document, which determined the site allocation for the KALC project..
For this and other reasons, Chapter 23 of the ‘Core Strategy’, which deals with the site allocation, misrepresented the nature and composition of the site by failing to acknowledge that a significant proportion of the site is comprised of public open space/green space, including the Royal Borough park known as Lancaster Green. Consequently, we believe the site allocation was determined without proper regard to the provisions of Planning Policy Guidance 17 (government guidance) and RBKC Policy CR 5 ‘Parks, Gardens, Open Spaces and Waterways’, both of which provide for the protection of parks and open spaces. We were advised at the time that it was already too late to contest the site allocation policy in the Core Strategy. However, the flawed Strategic Sites consultation had repercussions that continued through subsequent stages of the planning process, and only in the consultation draft of the SPD was the open-space on the site actually recognised in planning documents. The right to the protection of our open space and residential amenity, offered by a number of Core Strategy policies, and by National Planning Policy, had thus been fatally compromised with little or no meaningful local consultation. It should be noted that much of the accomodation in Grenfell Tower was occupied by families, and the only amenity space available to these families, and to other residents, was the external open space surrounding the tower, ie the playground area and Lancaster Green. Use of the playground was restricted to younger children only (ie under eights), so the remaining open space was essential to the recreational needs of older children and adults. During consultation there were many expressions of concern that the SPD provided insufficient protection of residential amenity. The siting of the development in an already densely developed residential area, and encroaching on the essential residential amenity space, were key concerns. The impact of the development on local residents was addressed on page 24 of the SPD, which suggested various measures, mostly design-based, aimed at mitigating this. However, we believe that the SPD underestimated the severity of the impacts, and that the suggested remedial measures were inadequate. For example, the SPD suggested locating the school buildings away from Grenfell Tower and along Silchester Road, at the opposite edge of the site. However, the school structure is massive. It left little open space, and effectively concentrated all the external activities associated with the school in the most sensitive part of the site (ie the area around Grenfell Tower), formerly occupied by the Lancaster Green open space. Furthermore, given the severe spatial constraints of the site, design-based measures were unlikely to be successful in significantly alleviating negative impacts like noise and congestion, and we believed that the only way to effectively safeguard residential amenity was by fully preserving the existing open space. This would have acted as a buffer to create separation between the high density residential area and any new development on the site. It is noteworthy that the Latimer Masterplan from July 2009, and the McAslan Feasibility Study from July 2010, both fore-warned the Council that the western part of the site, which was allocated for the academy, was not big enough to satisfy the Government’s minimum recommendations (BB 98) for a school of this size. Consequently all the early modelling for this project completely ignored the amenity-space needs of the existing community, in favour of the spatial needs of the school. The last-minute compromises offered in the SPD, in an attempt to mitigate these failings, were wholly inadequate. Given such equivocal statements it is hard to judge whether the intention was really to safeguard these assets for the community, or rather to create loopholes for the architects to exploit when drawing up detailed plans. The Grenfell Action Group suspected the latter rather than the former, and in time it became clear that we were abolutely right. When the architects produced their detailed plans it was clear that much of the open space would be lost, and what little remained would be carefully positioned and orientated to serve the various entrances to the academy and the new leisure centre. They even contrived to position an academy entrance near the back end of the complex, where the music and dance studios and the sports hall would be located. This entrance would dominate the supposedly private space reserved for the Grenfell Tower childrens’ playground. How crass and irresponsible was that? It is noteworthy that paragraph 5.3.11 of the SPD recognised that the all weather sports pitches on the site served a valuable social and community function, and paragraph 5.3.12 proposed to fund reprovision of this facility at the Westway Sports Centre. This would not satisfy the requirements of PPG 17, as the new facility would not be as accessible as the current facility, particularly to younger children, and the proposed reprovision would effectively exclude many younger children from the informal recreational use of the sports pitches which they had formerly enjoyed. It is noteworthy also that the SPD proposed neither a thorough assessment of the open space on site, nor reprovision of the substantial quantity of open space that would be lost. This was inconsistent with the requirements of PPG 17, and was therefore a breach of National Planning Policy. “…protect, enhance and make the most of existing parks, gardens and open spaces…(and to) resist the loss of public open space”. Clearly, the Core Strategy at least recognised the serious deficiency of open space throughout the borough, and sought to remedy this by prioritising the retention and improvement of existing open spaces, and by the creation of new high-quality open spaces. But these policy statements apparently meant nothing when it came to the KALC project, which collided head-on with the open-space and amenity needs of Lancaster West residents, and then simply brushed them aside. ‘The Council will protect, enhance and make the most of existing parks, gardens and open spaces, and require new high quality spaces to be provided. It would be a gross understatement to say that the Kensington Academy and Leisure Centre project flew in the face of all these objectives. One has to wonder what was the point of the Council’s open space policy, or of the GLA’s open space strategy, or of the Government’s planning policy guidance, if RBKC could simply ignore all of them with impunity. Who would hold them to account on this?